he said, " Nawaz, ignoring his own country, is taking action pleasing Narendra Modi." It is noticeable that Hafiz is the master mind of Mumbai terror attack; Azhar is master mind of Pathankot. 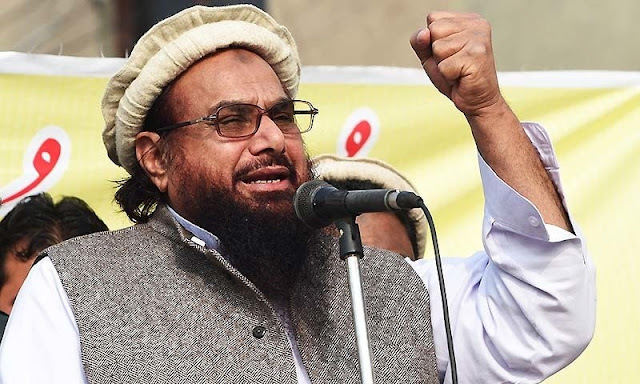 Hafiz saeed said, “I am saddened with the arrest of Azhar.” The arrest came to please Modi government. This act will cause the pressure on Pakistan taking Kashmir issue. He said, “Pakistan will have to retreat on Kashmir issue.” Nawaz Sharif government is ignoring the national interest. Sushma came to Pakistan with 6 point agenda, which of 2 were about jamat ud dawa. Masood Azhar is the terrorist, who was released in Kandahar after Indian airlines plane hijacked in 1999. The terrorists who attacked on Pathankot airbase talked through the satellite phone from Pakistan in Bahawalpur. According to the media report, Azhar dwells in Bahawalpur. The terrorists of Jaish get here training. The Pak agencies took him in custody from there.